Another dark picture, I'm not sure what's wrong with my camera. Anyhow, this chicken salad is really easy and you can vary it a lot. Cook chicken, set aside and shred when cooled. Add chicken to veggies and stir in Miracle Whip. 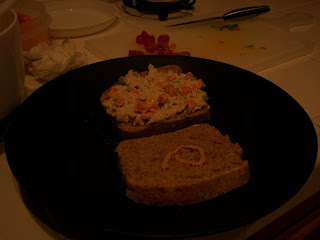 Served on homemade bread, it was delicious! It's always great in croissants, too.